The provincial People’s Committee recently sent a document to the Government, the National Commission for UNESCO Vietnam, the National Cultural Heritage Council and the Ministry of Culture, Sports and Tourism (MCST) to show their determination to follow an assignment by the MCST on seeking the title of Intangible Cultural Heritage of Humanity for xoe dance of the province’s Thai ethnic people. In the document, the authority stated that after consulting cultural experts about the artistic value of xoe Thai dance, the People’s Committee pledged to embark on the construction of a national profile for the dance. Xoe Thai art is a unique type of traditional dance that is associated with and plays a significant role in Thai communities in the northwest of Vietnam, especially in the provinces of Lai Chau, Dien Bien, Son La and Yen Bai. It depicts the daily lives of Thai ethnic people in Vietnam and shows their wish for a peaceful and prosperous life. Comprising about 30 different dances in total, xoe Thai is usually performed during community cultural festivals, funerals and cultural exchanges. The dance has been developed, protected and handed down through generations intact over hundreds of years in many different forms including xoe quat (xoe dance with a fan), xoe khan (xoe dance with a scarf), xoe non (xoe dance with a conical hat) and many others with contents reflecting community activities and expressing the Thai people’s emotion and ancestral spirits. The elegant dance has been named on the Government’s intangible heritage list to be submitted to UNESCO in the 2012-16 period. The provinces hoped the dance will receive UNESCO recognition this year. 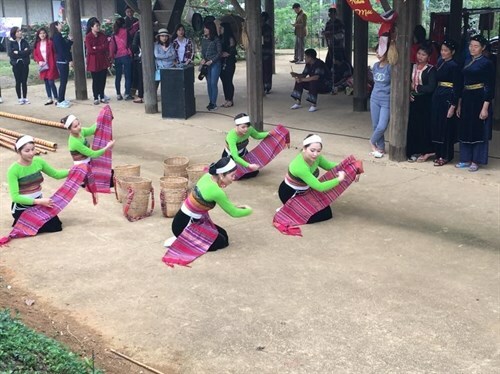 The UNESCO title is expected to elevate the position of the dance to national and international levels, thus promoting Vietnamese traditional arts and cultural diversity.